HyperPics.com Repeats as TenLinks.com "Site of the Week"
HyperPics is proud to be recognized for the second time this year as the "Site of the Week" by TenLinks.com. 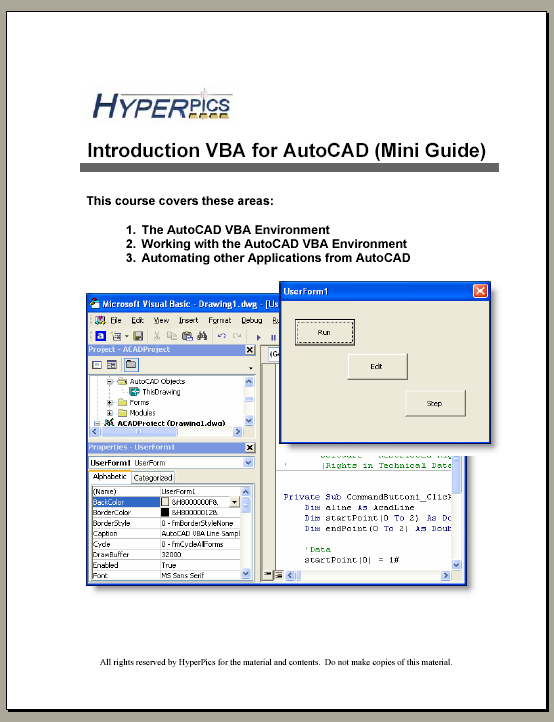 HyperPics was recognized back on the week of March 15th for have released a large number of documents for AutoCAD 2005. AU is just a matter of days a way and I am making my final preparations before leaving for Las Vegas tomorrow morning. This will be my 6th AU that I will be attending, I have attended all previous ones in Las Vegas and on in Chicago. This one will by far be the largest AU yet with what I have heard to be over 4,200 attendees. The number of attendees has caused Autodesk staff and some attendees to be located in other hotels around the MGM Grande, like New York, New York and Excalibur. See yeah at AU... I know I will be very busy with things. I will try and post pictures to my blog as I can during my time out there. I will be attending the ADN Conference on Monday and will be out there until Saturday afternoon, just look me up. It is great to see Lynn getting into the spirit of blogging. It will be great to follow her postings and tips that she will most likely share about AutoCAD and other Autodesk products. Have fun Lynn and I'm sure you will pass Shaan up in number of visitors quickly, sorry Shaan. Click here to go to Lynn Allen's blog. Shaan Hurley is a great friend that works for Autodesk and has many great postings from Technology to AutoCAD. Shaan hosts the Autodesk blog Between the Lines. I have spent a lot of time over the last couple of days and weeks working with ASP. I have never ventured into this area until recently due to some changes that I wanted to make to my web site. I used ASP to restructure one section, (Tips and Tricks), on my website around and introduced two new sections, (Command and System Variable References). I found a series of articles that were very useful when trying to figure out which direction to take for the redesign, ASP or ASP .Net. Of course, part of the decision is based on what is on the web server you are using. Most if not a majority of the web servers are most likely running the .Net framework to allow for the use of ASP .Net. Hope you find the information beneficial and educational. Just like the previous online resource that I just mentioned, the System Variable resource has been around for many years in the form of a PDF file only. This format works great for printing, but requires additional software though. This is what has driven me to redo some sections of my website. So I am happy to announce that the new System Variable map is on the HyperPics website. Many thanks goes to Shaan Hurley at Autodesk for putting up with me and my curiosity that I have for AutoCAD and other Autodesk products. Hope you enjoy going through it as much as I have enjoyed building and assembling the information. If you have questions or comments on the site just let me know. Click here to access the online System Variable section of the HyperPics website. Ah, less than one week to AU... time to kick into panic mode; run here run there. Ok maybe its not that bad, this should be another fun year and what looks like the last one in Las Vegas. I have enjoyed getting out of the cold of the Midwest at this time of the year, but change will be nice. I still remember my first year going to AU, which was almost the last one Autodesk organized. It was 1999 and Autodesk had decided to hold it in four different countries around the US. There were many complaints from attendees about this due to it being a shortened event by one day and lose of network with members of the around the industry. Anyways, getting back on track now... I will be at AU starting Sunday and will be there through Saturday. I will be involved in my different places at the event from teaching, to helping out in a class, to volunteering at the AUGI booth. I tend to get involved with a lot of things that some don't. If you see me in the halls of the Conference Center at AU, feel free to talk to me. Below are a couple nice postings that Shaan Hurley has done recently on AU. After many years in the making and some research recently; I am pleased to announce the new online Command Reference section of the HyperPics website. Some of the credit goes to Shaan Hurley at Autodesk for putting up with me and my curiosity that I have for AutoCAD and other Autodesk products. This new layout is the result of a joint effort to provide an in-depth amount of information on things in AutoCAD. The online format allows for quick accessing of the Quick Guide PDF for this that don't want to install of use a PDF reader or print it out, but if you want a hardcopy the PDF file is still provided for downloading. Hope you enjoy going through it as much as I have enjoyed building and assembling the information. If you have questions or comments on the site just let me know. Click here to access the online Command section of the HyperPics website. After posting Tips and Tricks for many years now; I have finally decided it was time to redo that section of the website. Before each Tip was a separate web page file and took much time to manage, but after some time of looking at ASP. I decided this was a good way to manage this data source. So I am pleased after a couple days of transferring the content and some research that the new Tips and Tricks section is up and running. Please let me know what you think as I am looking at making changes to other sections of the website to work in a similar manor. With any type of business one must advertise and look good doing so. I have started having logo merchandise made with my business logo on it. You can check out some of the items under the Logo Merchandise photo album in the left side bar. If there is something that you see that you might like to order just let me know. I am not taking orders yet, but hopefully will be setup to do so before the end of the year. Many thanks to the folks at Corporate Impressions for the great work they have been doing for me.